As much as I am loving presenting, sometimes I think that some of the children enrolled in my care could do just as good, if not a better job in teaching this topic! They have mastered the science kit, and have been having a great time exploring extension activities. 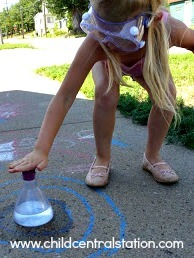 We LOVE to play with vinegar and baking soda! 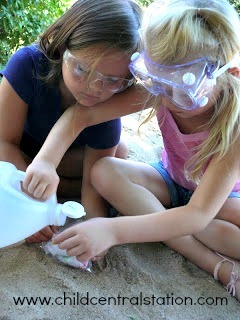 One of the fun extension activities with the science kit is to blow the cork off of the flask. Now, it took me a little while to figure out how to perfect this technique..... but we finally have it down to a science ;). First, you use the funnel to pour some vinegar into the flask. We haven't been the greatest at measuring, so just pour some in so that you have about an inch in the bottom of the flask. Then fill the cork about 1/2 way with baking soda. Then..... here is the most important step..... place a cotton ball in the top of the cork. This is going to keep the reaction from happening too fast and will allow you place the cork on the flask before the reaction starts. Each and every dinosaur needed to be placed just right before the volcano erupted! The oozing lava looked so inviting.... that..... the children wondered..... what does it feel like? I don't know..... let's find out! What kind of explorations have you been trying with children? Love this! Looks like such fun; they are certainly enjoying themselves! I loved the dinosaur volcano, what a great way to change the traditional volcano experiment. When we did blow the cork off we wrapped the baking soda in a small thing of toilet paper. Ticia- What a great idea with the toilet paper! I bet that would work great too! Our dinosaurs are never far away from anything we do. The children love to incorporate them in any way that they can!